Stop Chasing Invoices, Start Getting Paid On Time. Automated recurring billing for retainers. Never chase after another payment again. Not a marketing agency owner? See other use cases. It’s the marketing industry’s worst-kept secret. A recent study showed that over 65% of marketing agency owners consider unpredictable cash flow among their top 3 concerns, and 19% consider it their top concern. Generating new marketing leads and clients. Doing high-quality creative work for clients. …But too often, you find yourself “playing defense” because of the financial uncertainty that comes with unstable cash flow. With Chargeover, your cash flow woes are a thing of the past. 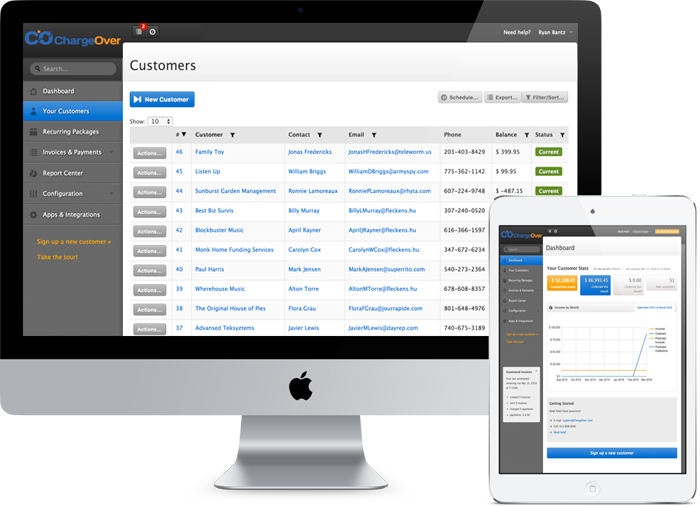 ChargeOver is a web-based software application for recurring billing that integrates seamlessly with all versions of QuickBooks, Xero, and other accounting software popular among marketing agencies. Studies have shown that recurring billing dramatically improves income stability at digital agencies, SEO/SEM consultancies, and ad agencies. With a recurring (or retainer) model, you charge clients monthly for ongoing service, instead of billing on a per project basis. As a result, you know exactly how much each contract pays each month, instead of wondering how many contracts you will close. ChargeOver lets you set up recurring payment plans in minutes. ChargeOver provides all the tools you need to set up and automate recurring billing. In the past, setting up retainers was a challenge, and monthly invoices had no guarantees of getting paid. Now, with ChargeOver’s recurring payment tools, you can charge a client’s payment method automatically on a pre-set schedule. All data from financial transactions is recorded in your accounting software instantly, saving time on spreadsheet management. 1. Get paid faster, without chasing payments. Although accounting tools include settings for monthly payments, you must still wait for the client to view and manually process the invoice. With ChargeOver, payments are processed automatically. The client’s payment method is billed instantly on a set date, and all financial data is synced to your accounting software. 2. Build a stable, recurring revenue stream. Recurring income is more stable and predictable than per-project income. When clients pay on a set date every month, you know exactly how much you’re getting paid, and when. ChargeOver lets you set up recurring revenue stream through automated monthly payments for retainers. Within minutes, you can set up retainer agreements for recurring work, and establish new, stable income streams. Traditional invoicing can be time consuming, involving large amounts of manually entered spreadsheet data. With ChargeOver, manual invoicing is a thing of the past. Whenever a charge is made, the client is sent an invoice automatically, and all data is synced with your accounting software. Switching to ChargeOver’s automated invoicing will help you save time on data entry and invoice creation. 4. Give your clients more billing options. ChargeOver supports per-project billing as well as recurring payments for retainers. Although we recommend recurring business models for marketing agencies, we understand that not every client will opt for a retainer. Accordingly, ChargeOver includes per-project billing options as well as recurring, so you can offer clients flexible payment options. We know running an agency is a busy life, so we made it super easy to get started with ChargeOver. There are no contracts to sign or costly development work to perform. Simply create your ChargeOver account and start using it in minutes. And, to make it even easier, your first 14 days are free. So you can test-drive ChargeOver’s great features without any risk.